For the roller coaster, see Codonas Amusement Park. For The Cleveland Show episode, see The Cleveland Show (season 4). "You Lookin' at Me Lookin' at You"
AllMusic reviewer Steve Huey described the main guitar riff as "a classic, making use of the full minor scale in a way not seen since Ritchie Blackmore's heyday with Deep Purple." The song is one of Osbourne's best known and recognizable as a solo performer. It was rated 9th greatest guitar solo ever by readers of Guitar World magazine. The song was also ranked 9th by VH1 on the list of the 40 Greatest Metal Songs and in 2009 it was named the 23rd-greatest hard rock song of all time also by VH1, the highest placement by a solo artist on the list. The single reached No. 49 on the United Kingdom singles chart in 1980. In the United States, the song reached No. 9 on the Billboard Top Tracks chart and the single peaked at No. 6 on the Billboard Bubbling Under the Hot 100 chart in 1981. The master ringtone was certified double platinum and had by September 2010 sold 1,750,000 downloads. The song has become an unofficial theme song and entrance anthem for the New England Patriots at their home games and Super Bowls, starting when they hosted the NFL Kickoff at Gillette Stadium on 8 September 2005. The song was featured prominently in the 2010 film Megamind. ^ Kajzer, Jackie; Lotring, Roger (2010). Full Metal Jackie Certified: The 50 Most Influential Metal Songs of the '80s. Course Technology. p. 43. ISBN 978-1-4354-5441-5. ^ Mick Wall (1 February 2012). "Randy Rhoads: The Guitarist Who Changed The World". Classic Rock. ^ Huey, Steve. 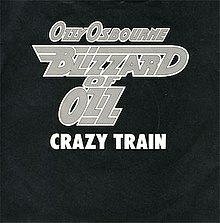 "Crazy Train - Ozzy Osbourne". AllMusic. Retrieved 16 April 2010. 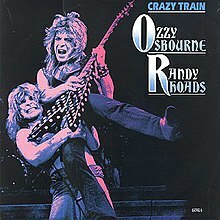 ^ "Crazy Train by Ozzy Osbourne Songfacts". Songfacts.com. Archived from the original on 30 July 2012. Retrieved 16 April 2010. ^ "100 Greatest Guitar Solos - Tablature for the greatest guitar solos of all time". Guitar.about.com. 2 November 2009. Retrieved 16 April 2010. ^ "Original TV Shows, Reality TV Shows". VH1. 30 September 2016. Retrieved 16 October 2016. ^ "Vh1 Top 100 Hard Rock Songs". spreadit.org music. Archived from the original on 12 February 2009. Retrieved 7 February 2009. ^ "Ozzy Osbourne". www.officialcharts.com. The Official UK Charts Company. Retrieved 8 September 2017. ^ Whitburn, Joel (2002). Rock Tracks. Menonomee Falls, Wisconsin: Record Research Inc. p. 103. ISBN 0-89820-153-5. ^ "Chart Watch Extra: Songs From The Last Century". new.music.yahoo.com. Archived from the original on 5 October 2010. Retrieved 5 July 2016. ^ "The Crazy Train That Led To Patriots Introductions - Lou Imbriano". louimbriano.com. Retrieved 4 February 2019. ^ "Megamind (2010) Music Soundtrack & Complete List of Songs - WhatSong Soundtracks". What-song. Retrieved 4 February 2019.